I was born 3rd June 1983 in Szeged (Hungary). Grew up in a little town in the south called Mindszent placed on the river bank of Tisza. Started playing alto saxophone at age 12. Got my musical basics from Ferenc Krupiczer, László Kaszás, Attila Arany-Tóth, Attila Bencsik at music school in Mindszent. Jazz touched me at secondary school (Bethlen Gábor Református Gimnázium) when I switched to tenor. This time I was invited to my teachers bands. We played at weddings and parties around. It was very good ear trainingfor me, because they didn’t have any rehearsals and scores at all, I just listened to music and played by heart. This time I also participated of the local brass band in Hódmezővásárhely. We played at the Hungarian Pavilon at the Hannover Expo 2000. In 2001 an audition at Liszt Ferenc Academy of Music led me to have music as my career. This year I admitted to both school: Budapest University of Technology and Economy and Erkel Ferenc High School of Music (today: Jazz Department of Béla Bartók High School of Music) in the same time. My first saxophonist saxophone teacher was Gábor Kollmann. He built me up again from basics, theory and improvisation technics also. One of my oldest musical friend is from this school also. With the guitarist Gábor Csongrádi we based our first jazz quartet together. About this time I started to compose. We have still this band with Ákos Benkó and Márton Soós named Ávéd-Csongrádi Quartet. In 2005 I got new wise teachers: Mihály Borbély and István Elek. They picked me up as a new saxophone student of Jazz Department of the Liszt Ferenc Academy of Music. As a student we participated in project called: Souffle d’Orient at Centre Pompidou, Paris. That was a part of their series Les Jeudi’s (13.03.2008). Got my academy degree in 2009. My thesis theme was Polytonality in Improvisation: Disjunction and Conjunction of Triad pairs – Hexatonic structures (published in hungarian). 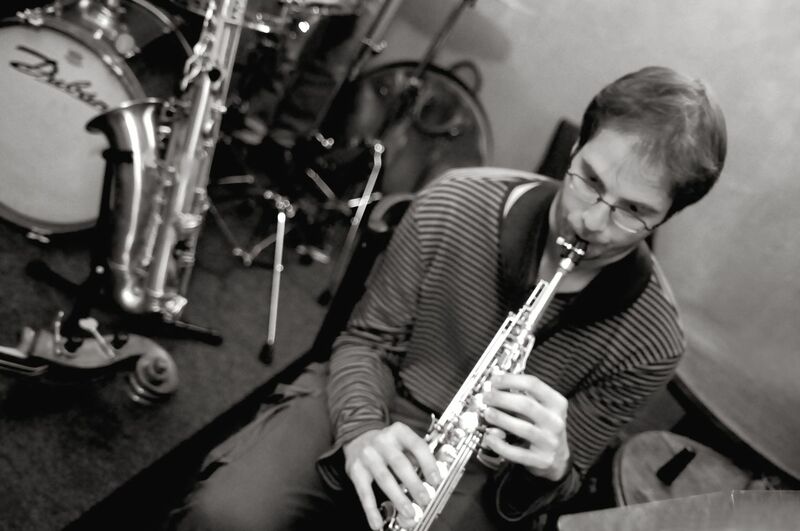 I finished my MSc in 2012 as jazz-saxophone teacher at Liszt Academy also. The Transform Quintet was my first professional band in 2006. Made my first studio recording with them also. I got the experience of touring with Transform feat. Joey Calderazzo. Till 2009 we worked together. In January 2008 Kornél-Fekete Kovács invited me to his big band, Modern Art Orchestra (MAO). I’m still learning here many thing about music, obsession, composing, arranging, staying power. Many musical experiences I got from the MAO cooperations: Péter Eötvös, UMZE Chamber Ensemble, Perico Sambeat, Marc Miralta, Bert Joris. With the same band we had the opportunity to represent Hungary at the Shanghai Expo in 2010. I’m trying to strenghten my funk side at Blue Bunny Hammond Band. This time I started to study counterpiont and analysis with the composer Árpád Barabás. With some other young player from the jazz scene we estabilished the Konzervnyitó Akciócsoport for finding connections beetween our music and other people outside of music. In our monthly concert series we serve new compositions according to our guest and the theme of the evening. Beetween musical blocks we discuss about this theme with the guest and the audience. Had a short trip to folk based music with the marvellous singer Szilvia Bognár, great experience. In 2011 I started to use my studies in composing in my trio called János Ávéd Balance. Our long musical friendship with Márton Fenyvesi and Ákos Benkó helps us to find the best choices in music while playing. In concert we try to make music as a free formed random music sequence from my originals theme. Using only musical cues on the spot. In 2012 it was great honor to play with Miroslav Vitous and Ferenc Németh as a member of Liszt Academy Senior Big Band. One year later I was invited to another “Balance band”. Gyula Babos the famous hungarian guitarist requested me to play soprano and keyboard as a sideman in Babos Ba-Lan-c-E. This music is based on the harmony of hungarian and indian gypsy roots. European Saxophone Ensemble tour 2012 was for me the first international project where I got many new friends all over Europe. The artistic director, Guillaume Orti is one of the most influental musician in my life. Besides his wonderful music I learned many new views of musicianship: naturality and humility in music. In October 2012 had debut concert with my own music arranged for MAO. On 12th January 2013 with Marton Fenyvesi and Ákos Benkó had the opportunity to play together with David Binney was wonderful inspiration of developing my ideas with Ávéd János Balance. Ávéd János Quartet (from 2013) is a band approaches improvisation and music as an abstract stylistic-independent thing. We are coming from different backgrounds, from folk to classical and jazz, researching a new common language. Fassang László is one of the most important improvisator of the hungarian classical organ scene. Drives me to find new waves and sounds of playing.